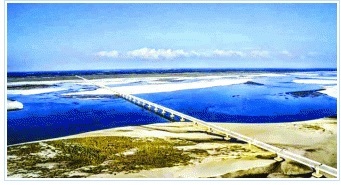 9.15km long, as of now the longest river bridge over the Brahmaputra river in Assam will soon come into operation. It will be close to the China border, only about 100 km as the crow flies, and can carry battle tanks weighing over 60 tonnes. So the bridge will help with critically needed connectivity in the North-East, in this case for Assam and Arunachal Pradesh but also to build up our defenses, which was long overdue. The next bridge over the Brahmaputra is hundreds of kilometers away in a region with large distances but limited infrastructure.